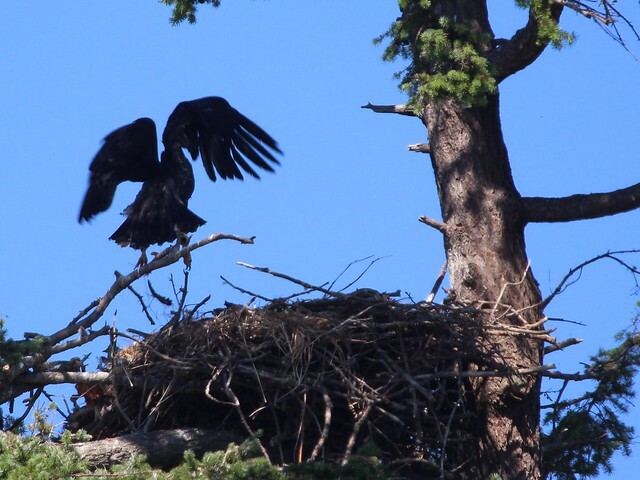 This thread is for photos and discussion of the Dunlop Nest and its territory. 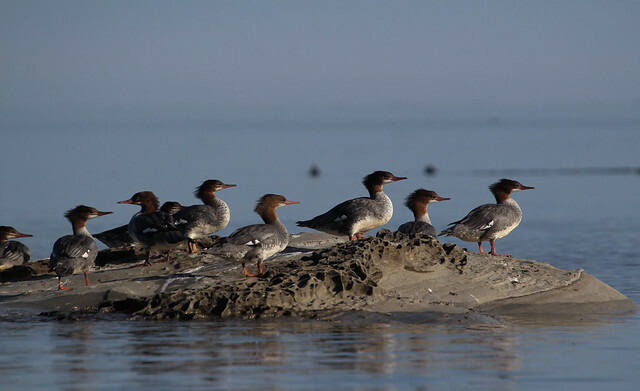 Dunlop Point dries up to a long series of reefs at low tide, and is adjacent to Nash Bank, a popular fishing spot for eagles and humans alike. The seals like it too. 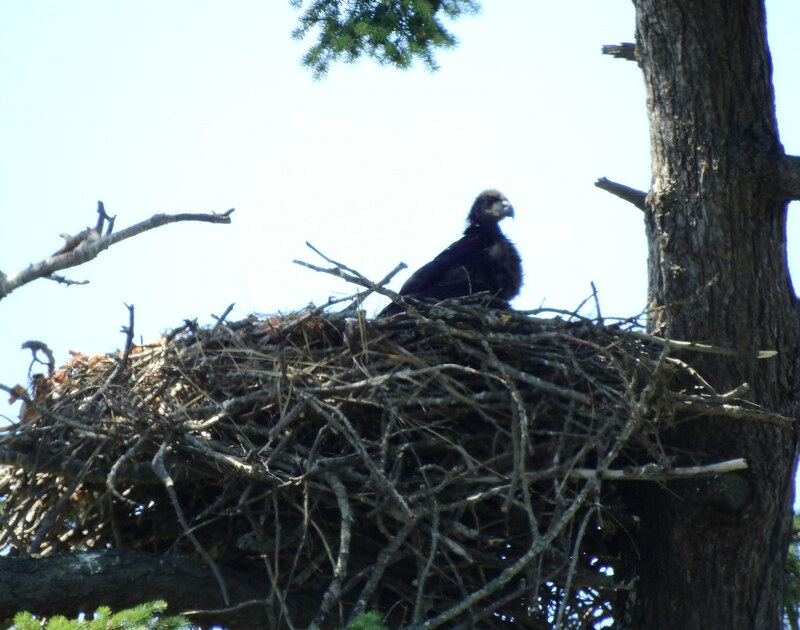 This nest has produced two eaglets most years, but last year there was just one eaglet, and the year before, in 2013, the nest was silent. 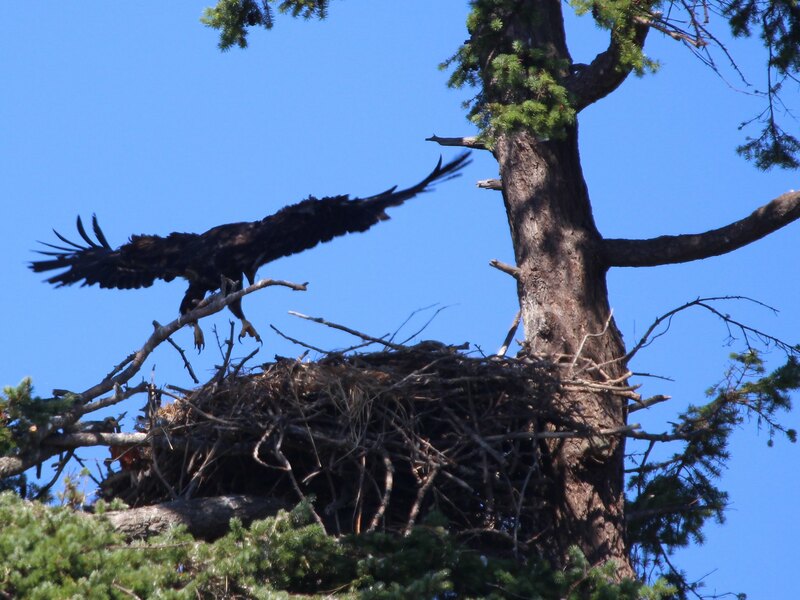 The neighbours told Booni that there was an eaglet early in the season, but it did not make it to fledging age. To see the postings from the 2010-2011 season, click Here. The 2011-2012 postings start Here. The 2012-2013 postings start here. And last year's postings are here. 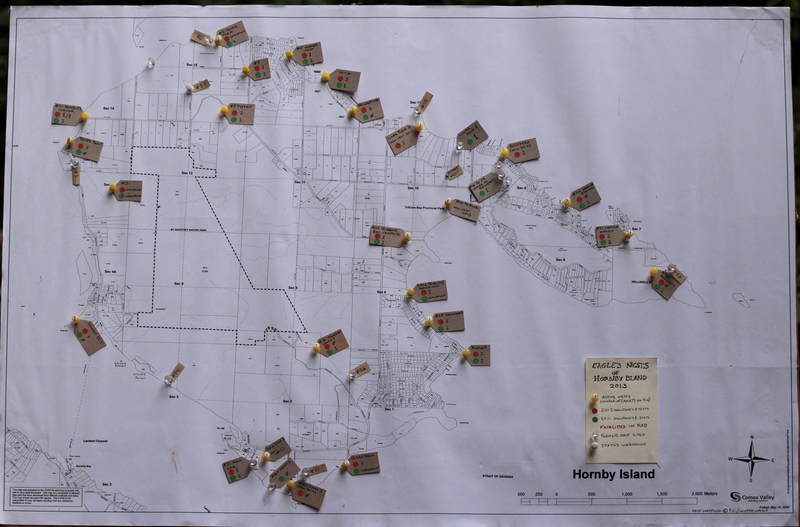 Here's a copy of last year's map of the nests of Hornby Island. The Dunlop Nest is toward the lower right of the map. 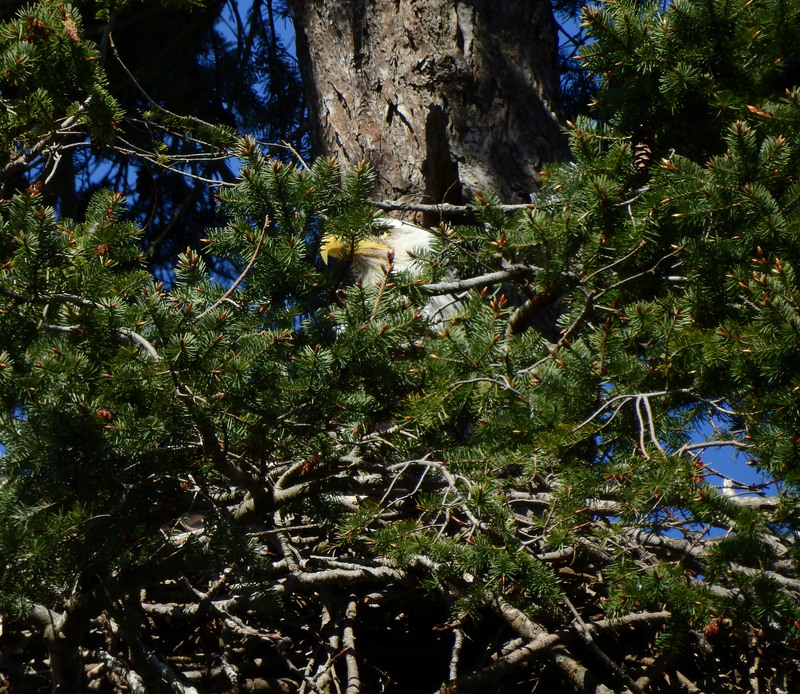 Last Saturday, September 27, I was in the neighbourhood of this nest when I spotted an eaglet atop a tree! 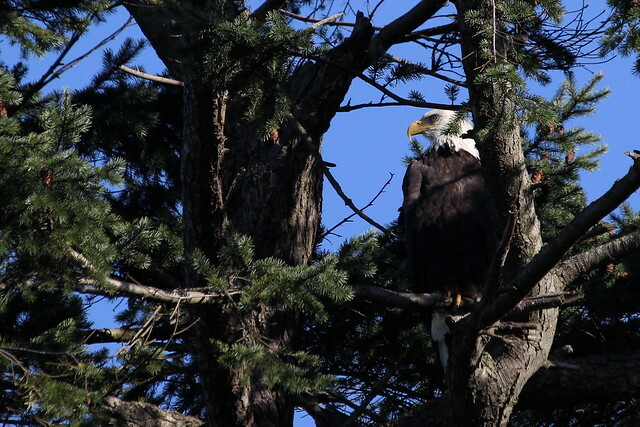 While I took photos, a neighbour walked by and told me that this tree, a little way inland from the nest, is actually a favourite perch of the Dunlop pair. 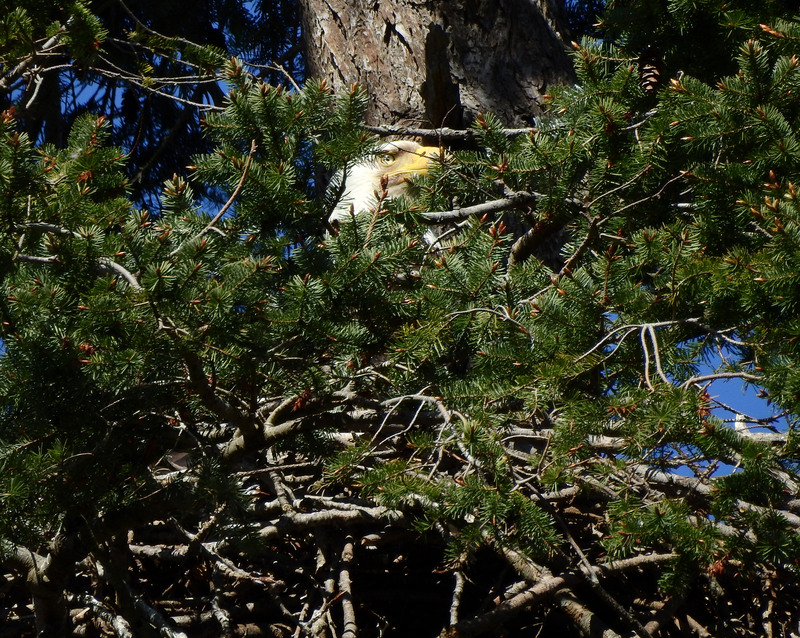 Then I noticed there was another eagle further down the tree! 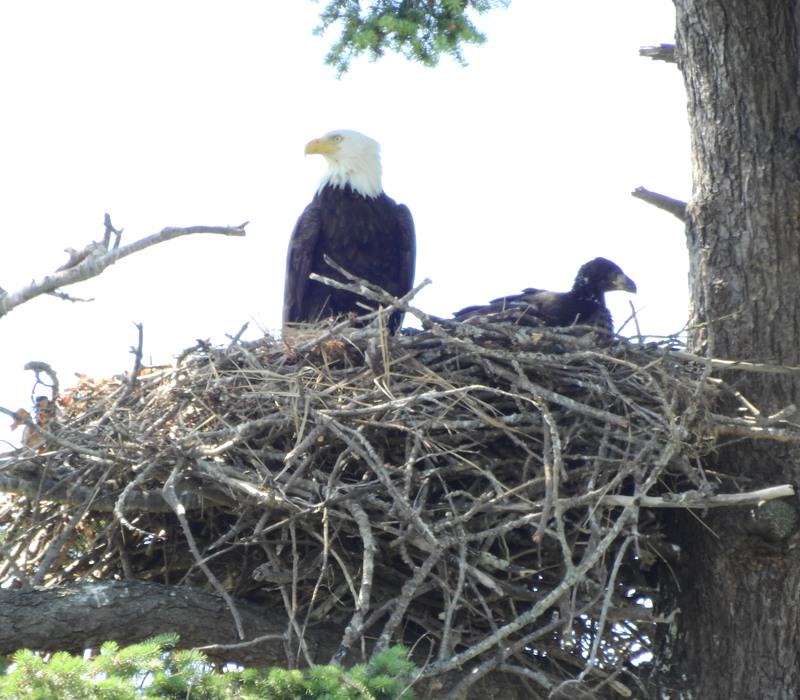 So quite possibly these are the resident eagles. 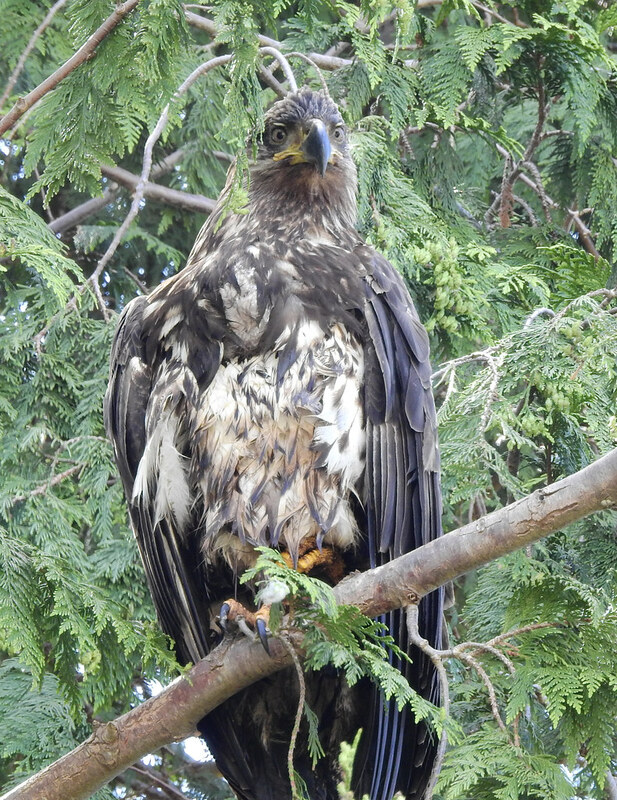 Here's the same eagle again... With a hairdo like that I'm inclined to think it's Mom Dunlop. 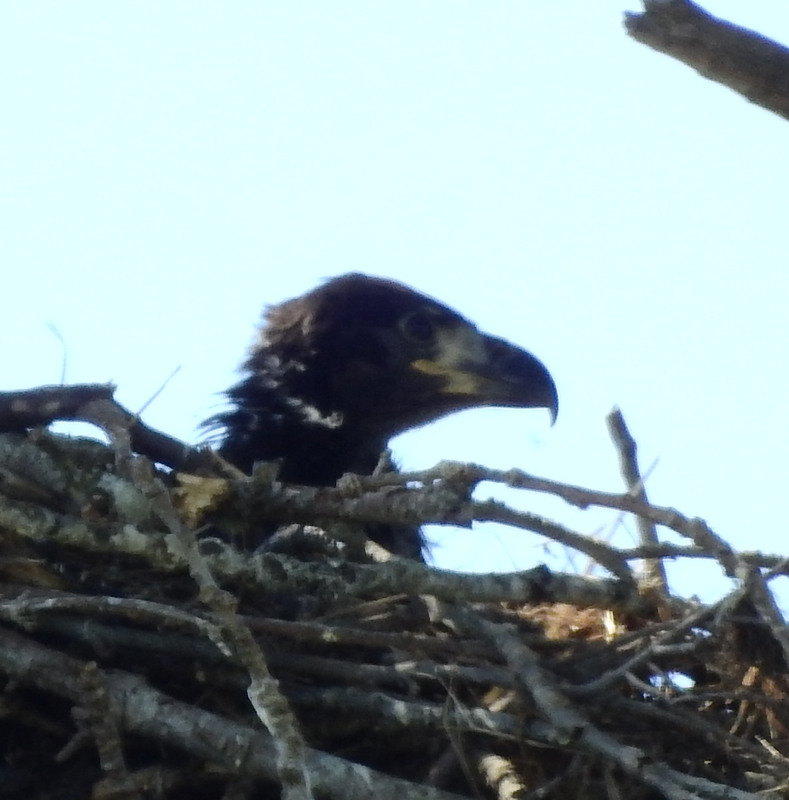 And here's the second eagle. On two evenings in a row, October 7 and 8, I took a little sunset cruise in the area of this territory. Just a week before, a fishing eagle was a rare sight over the water. 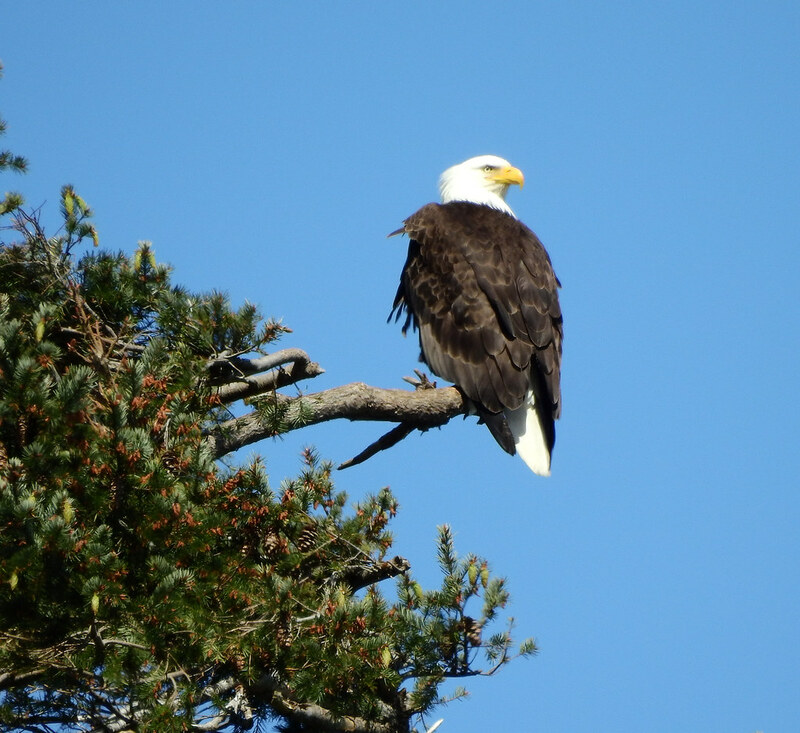 On those days, however, I saw several, including this one looking down at the water while also watching me, as I left Sandpiper Beach. 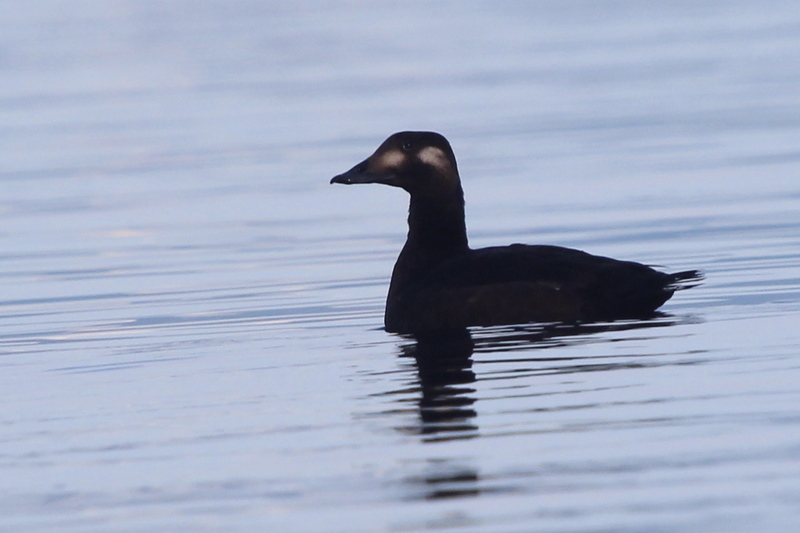 A mysterious dark bird, caught napping offshore; she turned out to be a female White-winged scoter! 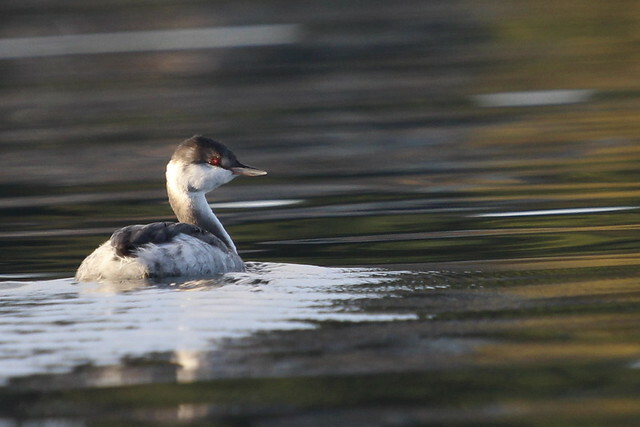 Then suddenly right beside the Grebe, a Rhinoceros appeared!!!! This is only the second time I see one of those, so it made my day, which was already going quite well! 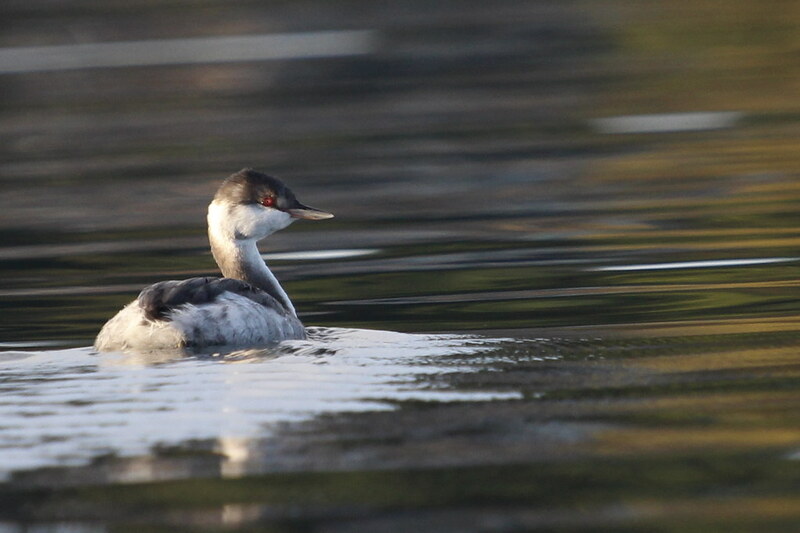 On my way back, I finally got close enough to a Horned Grebe to get some clear shots. 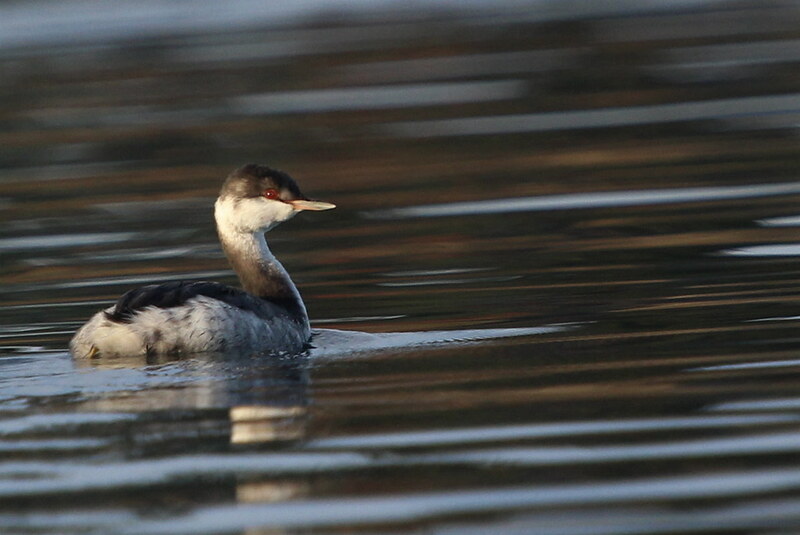 You can sometimes see these, and the Red-necked Grebes, from the cam. The Horned Grebes are the smaller ones and often fish closer to shore. 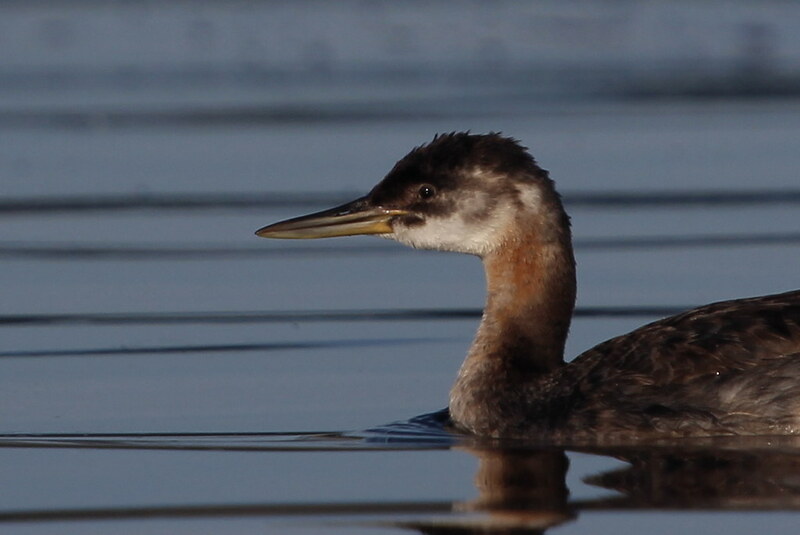 I saw my first Red-necked Grebe this weekend - flying a bit offshore, but I got good looks at it (thanks to the Audubon group leader, who also told us what we were seeing. 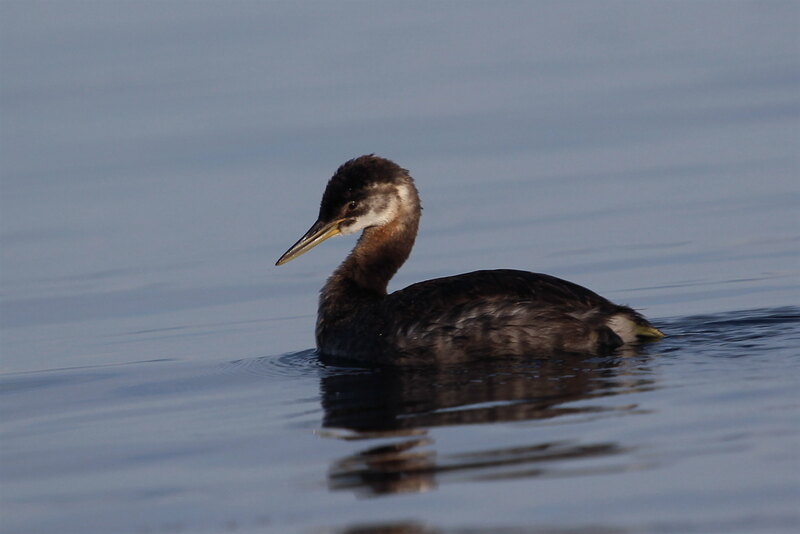 The migrants are streaming through just now, it is amazing to think of the journeys they take twice a year. Yesterday i went to the Chicken farm to get dogfood for Otto. She has three big Dogs there, & everyone was having a romp in the Apple orchard. Otto was trying to figure out a Donkey, who was VERY interested in him! They have Horses there, as well as the Donkey & the Chickens. 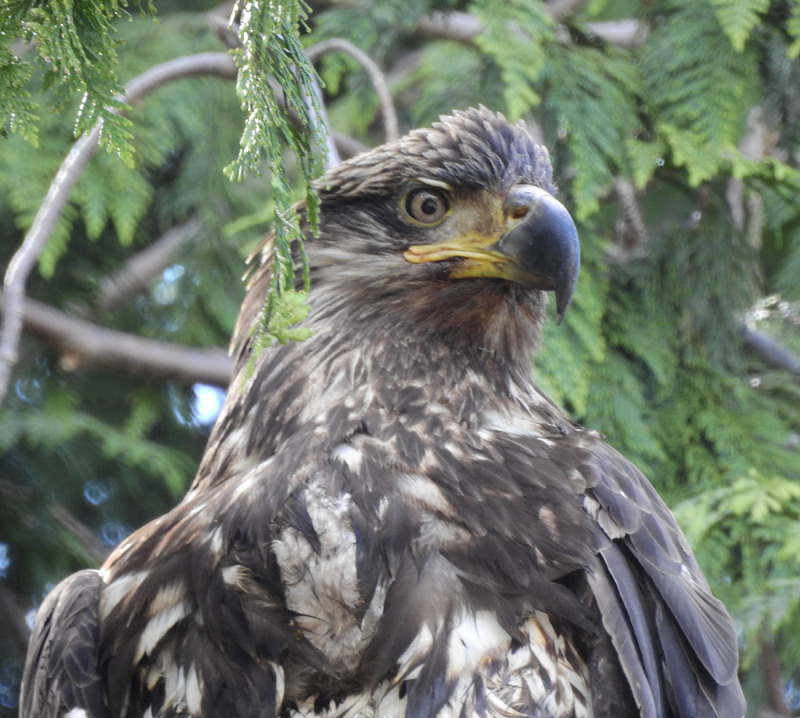 So the tractor makes a big heap of all the hay & manure, & a big Eagle was right on top. 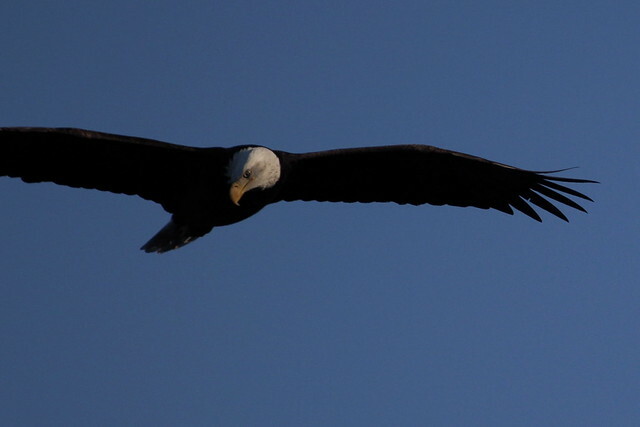 The Eagle was trying to fly away with a big clump of something from the pile, but it was too heavy to let them lift off. For they have Sheep & Lambs as well. Her & her Dogs made their way towards the pile to look. 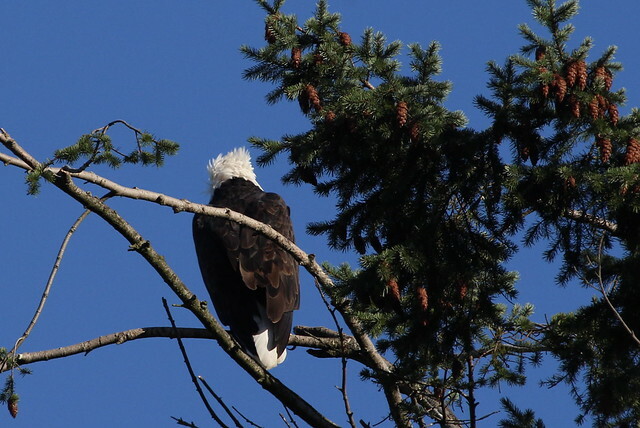 The Eagle kept trying to lift of with their clump. But they finally had to let go when the woman got too close. Turned out it was a big clump of straw & manure, so more nesting material, heading for the Dunlop Nest this time, likely. 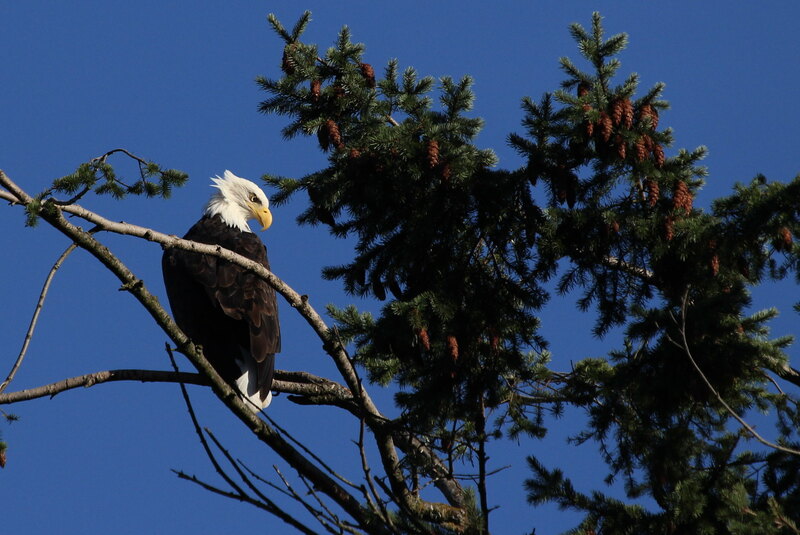 Spotted this little sweetie in, i believe, a Cottonwood Tree? It is up on a bank with a nice view of the bay & shores. The Dunlop Nest is a good ways to the left, so i am putting this Eagle in this territory. 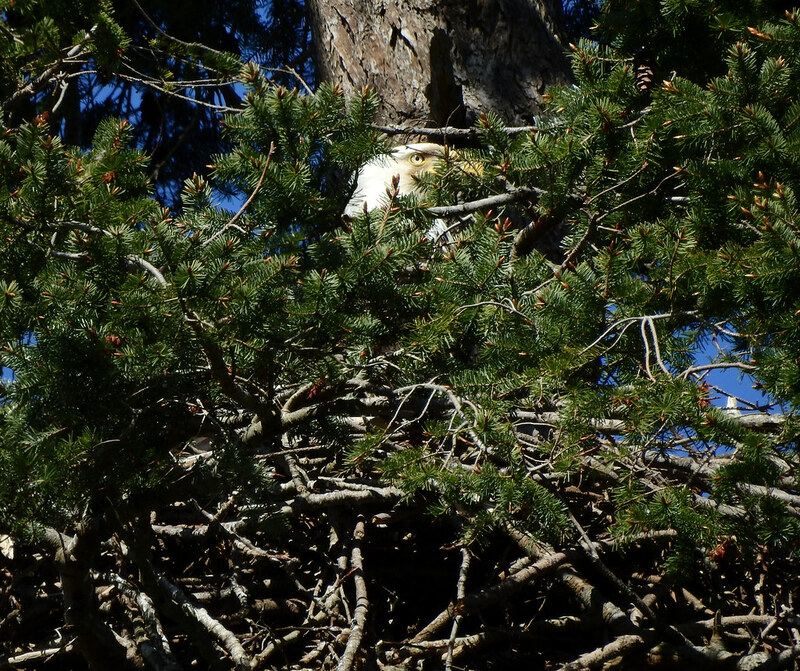 However, i do wonder if there isn*t a Nest just to the right a ways, nearer to Downe*s Point. i believe Winters* Nest is quite a bit further to the right wren? 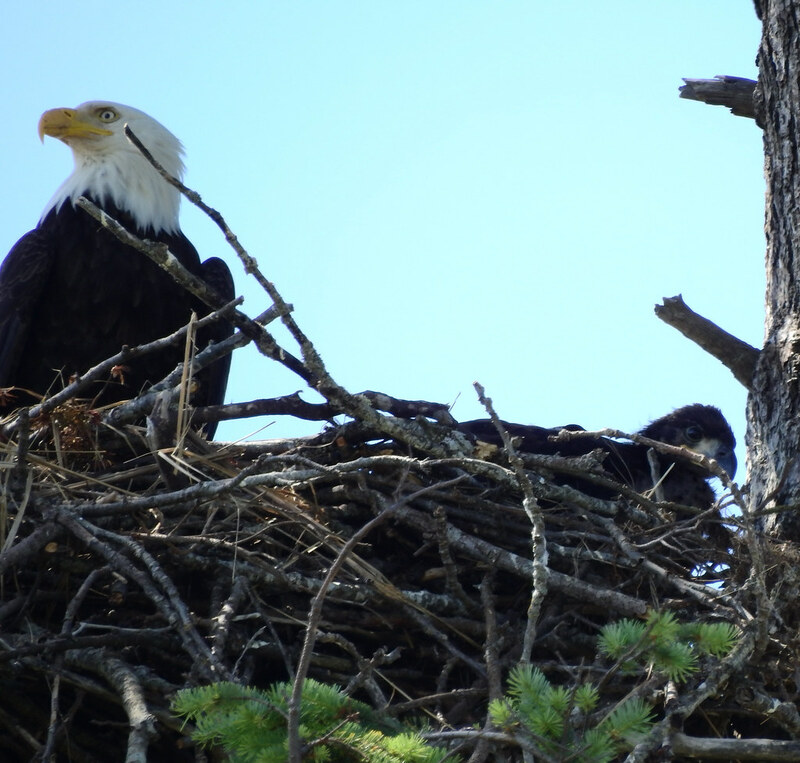 Today we were down on the beach in front of the Dunlop Nest, & i thought i could see a white head up there. Of course, as soon as i got my camera out, the head disappeared. But i persisted, & the head re-appeared! 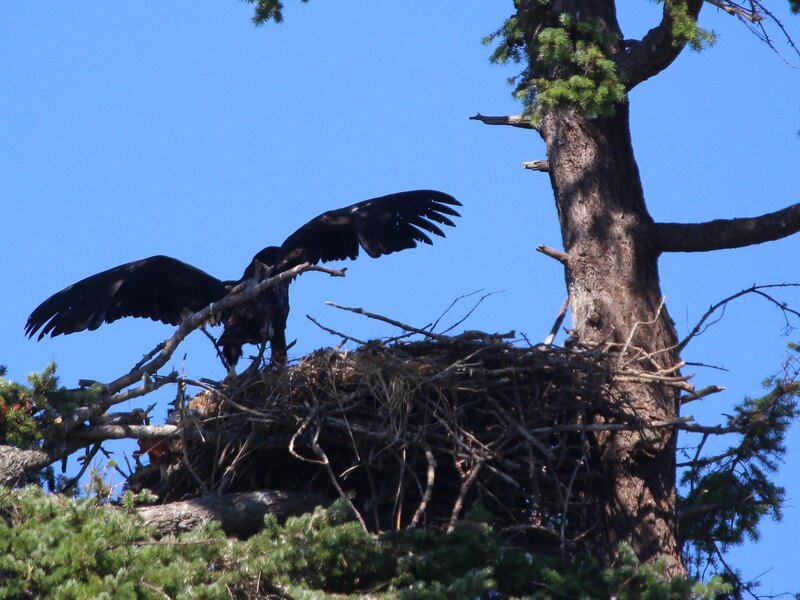 There could be hatchlings here! Here*s the mate, in a perch Tree, closer to the Point. Yesterday we walked the beach in front of Dunlop Point. 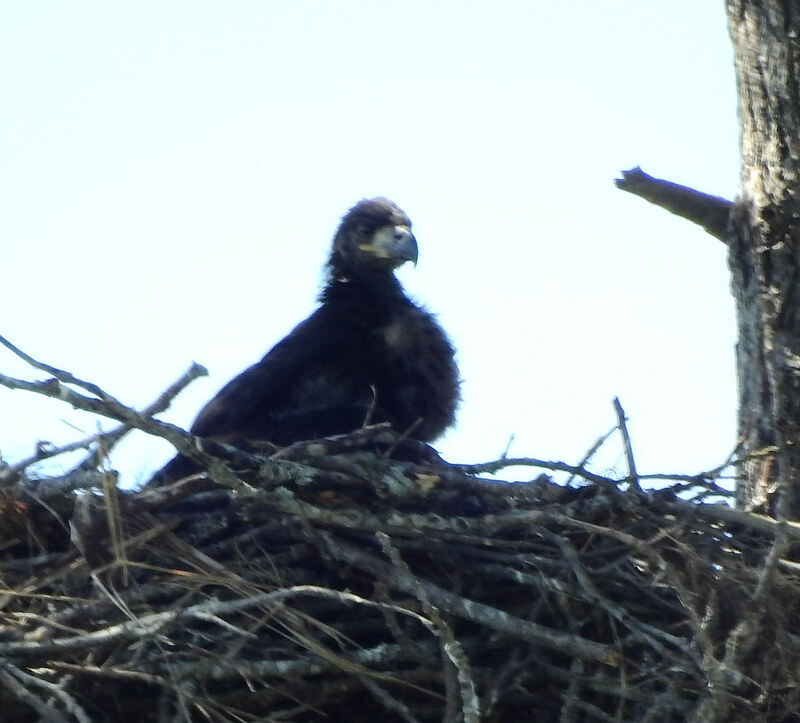 An adult was standing on the Nest for a long time. i got some fotos but then had a memory card glitch & lost them all. 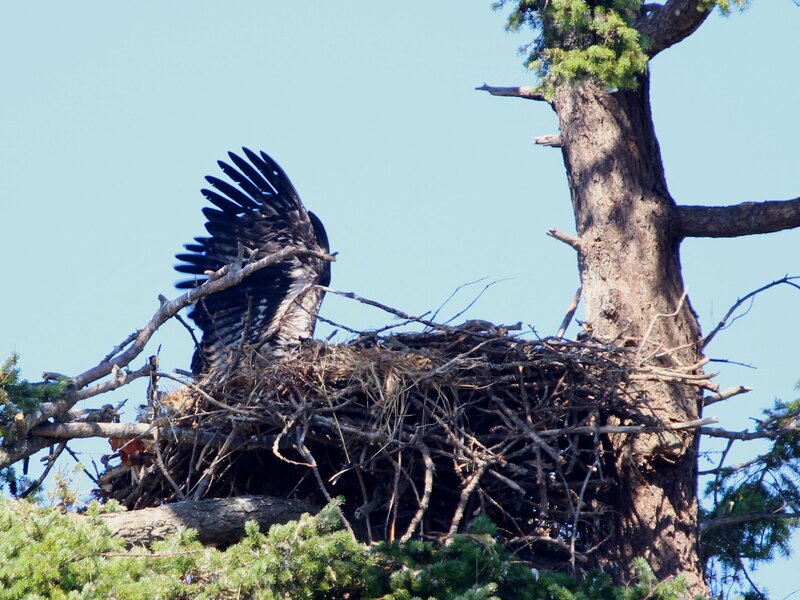 At one point, both adults flew out into Tribune Bay, one after the other. When they came back, they were together in a perch Tree. 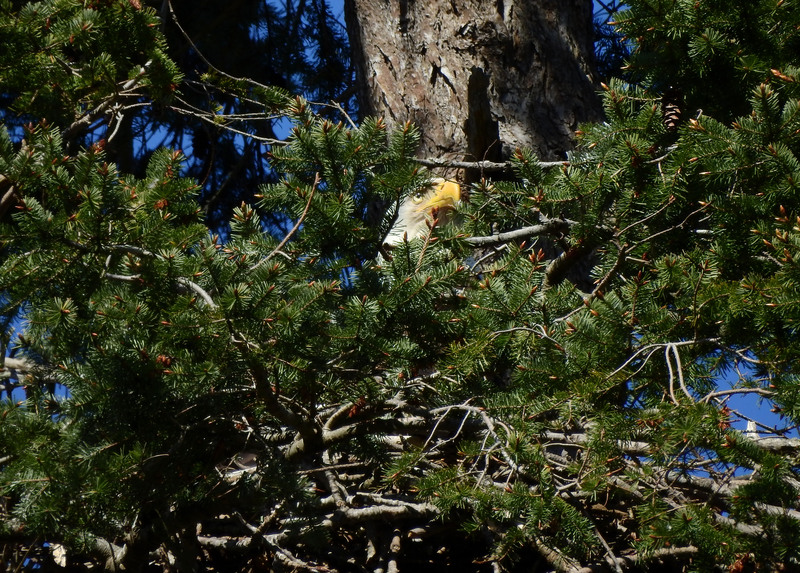 i was trying to take fotos of the Nest, but couldn*t.
So i*d say there are still nestlings here. 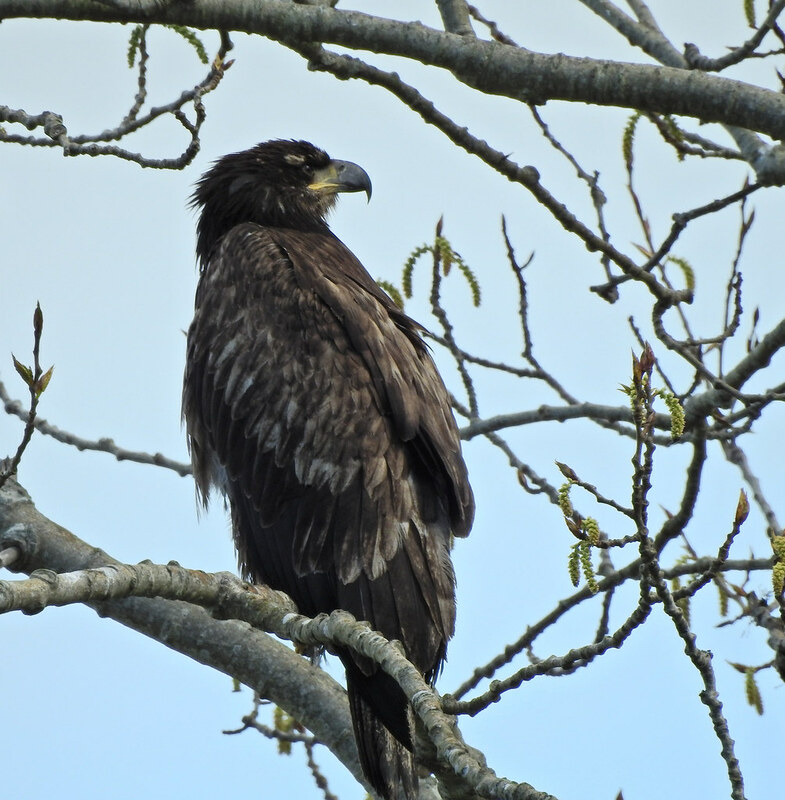 This youngster was hanging out near Sandpiper beach. There was a dead Seal down on the rocks. A one year old, just turning two? 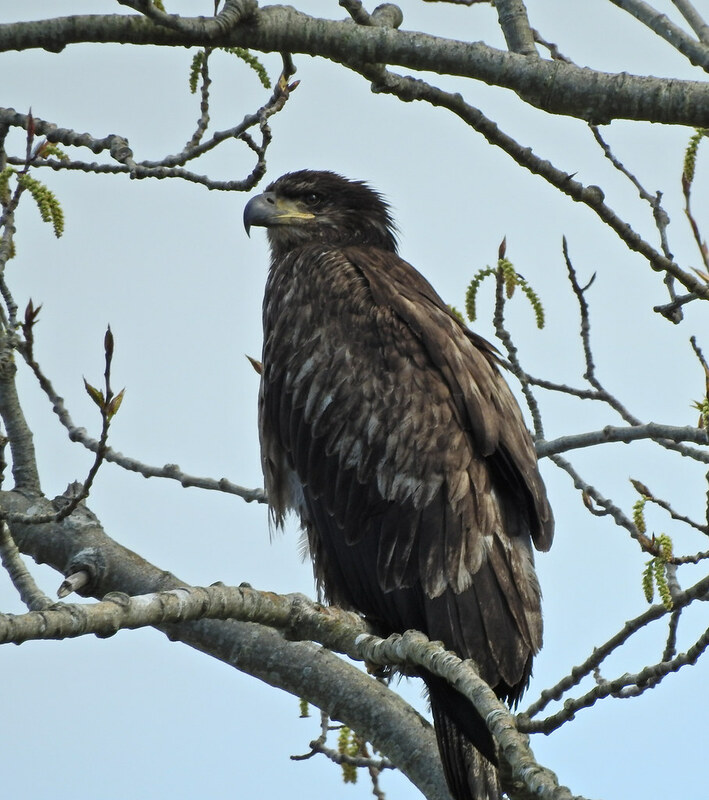 The breast is turning white, beak is still quite dark, eyes are still brown but turning lighter brown, light cap of feathers on the top of the head & underneath the chin. We went for another walk along the beach from Sandpiper to Dunlop Point. This time my memory card did not fail me! 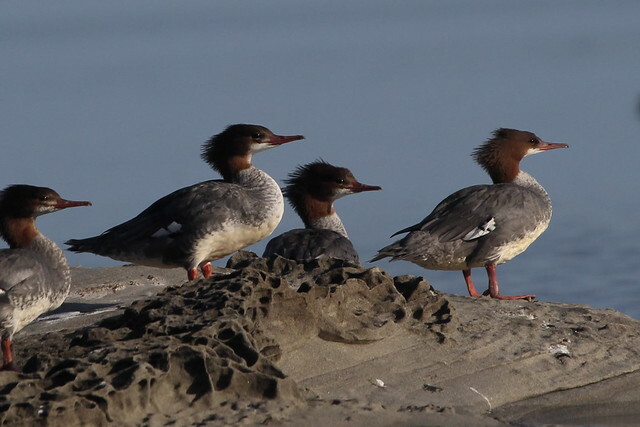 There is at least one youngster here! 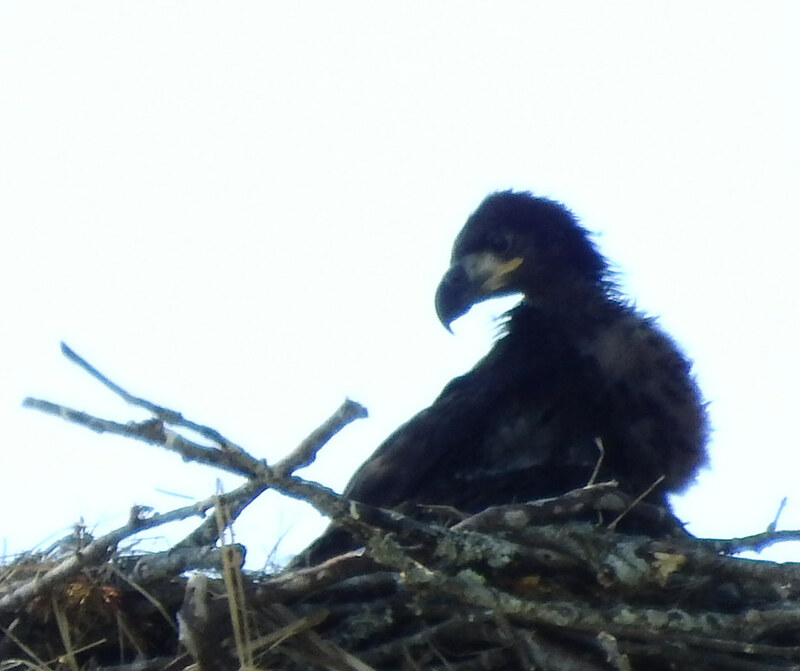 They are already growing in their brown feathering, wow. Photos from July 1st... 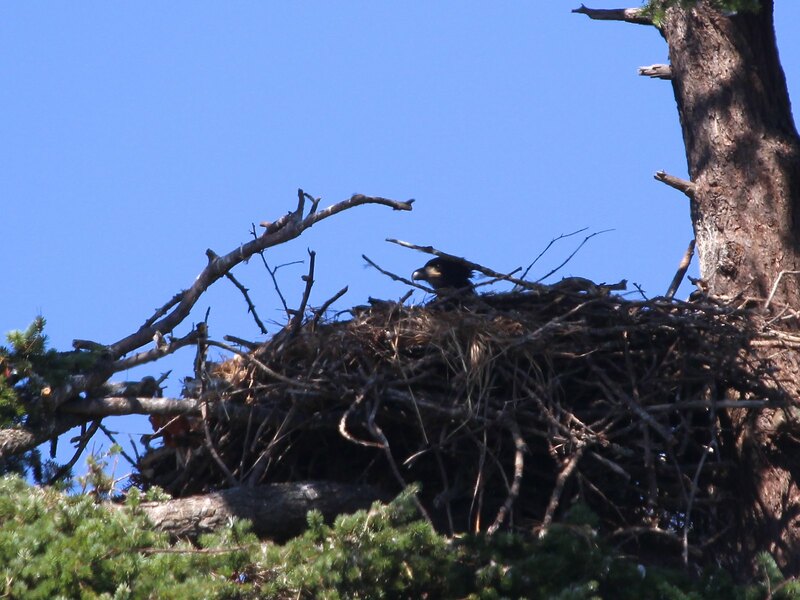 I walked the beach all the way from the Little Tribune nest, past Nest 25 and to this nest. It was my turn to have camera glitches so I missed a feeding but caught the high-energy flapping thereafter! There seems to be just one eaglet here this year. 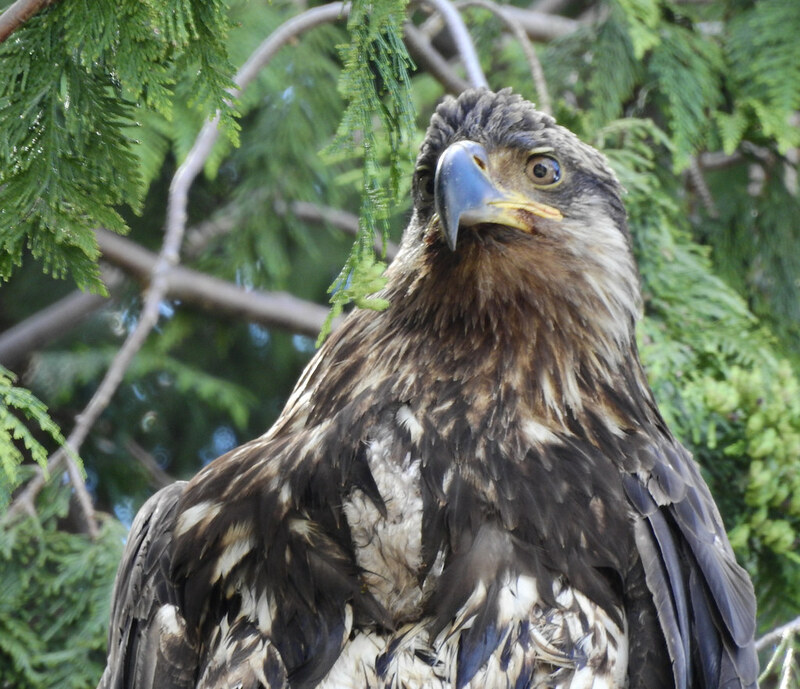 His feathers look kind of beat up. 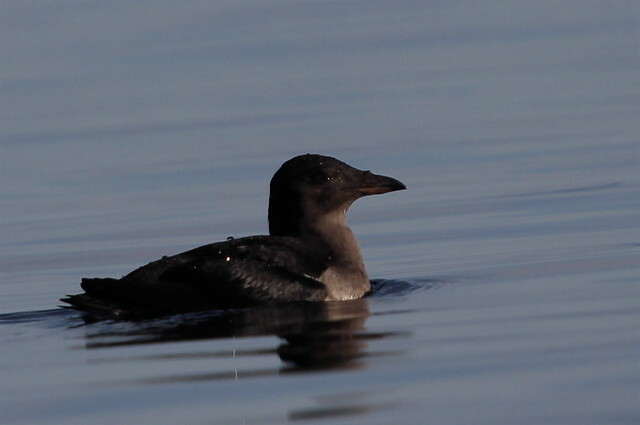 Through this sequence there was a piece of grass clinging to his beak but by the time I left it was gone.